Also known as Wat Yai, Phitsanulok’s most famous temple is home to Phra Phuttha Chinnarat, regarded as one of the most beautiful Buddha images in Thailand. A temple has existed on the site for over 700 years, evidenced by the laterite ruins of a hall that housed a large standing Buddha constructed during the Sukhothai period. The standing Buddha remains today, though one questions whether modern renovations that rendered it bright yellow and white detract from the ancient atmosphere. A similar colour scheme was applied to a large Khmer-style prang placed behind the standing Buddha. The prang was thought to have first been built during the Sukhothai period but was later adapted to its current appearance. Wat Yai’s highlight is Phra Phuttha Chinnarat, a truly exquisite bronze seated Buddha image in the subduing Mara posture. It’s believed to have been cast under the watchful eye of King Phraya Lithai when Phitsanulok was the capital of the Sukhothai kingdom in the 1300s. 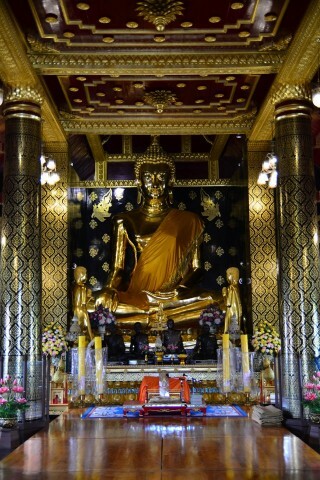 Thais believe that praying to the image will bring success in life. It’s housed in a small but attractive wihaan with wall murals depicting scenes from King Naresuan’s storied life -- complete with descriptions in English. The complex also features a statue of Naresuan along with an ancient stone coffin placed on a pyre adorned with glittering shards of mirror glass, a representation of Buddha after he attained nirvana. The temple complex is rather cluttered, with a large souvenir market and more recently built structures occupying much of the land. There’s even an ATM and tourist police booth.